Like the last post, we’ll stick to the “stories à daily route à pictures” format here. Thanks for reading! **Update on “Stuck in Barra” : It takes a while to find internet for posting, so I write you a few days later now. We’ve left Barra now (wahooo!) but not without some stories to share. By the last couple days at the marina, we were beginning to think the Arctic Loon didn’t want us to cross the ocean. The was constantly something new to deal with. One night, while waiting to hear from our mechanic about the alternator, an alarm started going off near the helm. We all groaned, and investigated to discover that it was the water witch, a sensor to tell us if there’s water in the bilge. We opened the bilge, investigated thoroughly, and determined that it was completely fine. No water at all. So that’s good news right? Not so much. After pushing the mute button a million times, and reading the manual over and over again, we determined that absolutely the only way to turn off this alarm was to solve the bilge problem…. Which we didn’t have. With all of the other boat problems we’d been having, we didn’t know whether to laugh or cry. This alarm was high pitched and loud – impossible to sleep with, so we ended up calling over some guys on another boat to see if they could help. One was an electrical engineer, and the solution we all came up with? Tape a heavy water bottle to lean on the mute button. If held down consistently, the alarm was silenced. We slept, but had to deal with the issue the next morning. We ended up having to call the manufacturer – who told us we should try not only wiping the sensors (like we had) but also cleaning them…. Which bizarrely worked…. Thank goodness. Oh but our woes were not over. Our mechanic came and installed our alternator, which happily, made us good to go. We turned the engine on, planning to go further south, but found the engine coolant was leaking (likely due to our mechanic’s mistake)…. So we reluctantly stayed another day, did some yoga, had our mechanic fix it…. And the next day found it was doing the same thing! At this point, we didn’t trust our mechanic, and didn’t know what to do. It was leaking a little less, and we knew we could get to Puerto Vallarta (where better mechanics are) with the problem, so we took off, heading north. Buuuuut…. Good old Arctic Loon gave us another alarm about 20 minutes into our journey. This time our REGULATOR wasn’t working. Oh how we laughed and cried. After a lot of brain work and analysis, we’ve come up with a mechanical trick (involving shutting down our alternator and only using solar power) to make it to PV without too much of a straing , but Captain Diana has started (jokingly) referring to our adventure as Apollo 13....will they make it??? We shall see…. Oh please, let us just make it Puerto Vallarta (PV): The funny thing about this blog is that it’s written slowly… so I write this several days after the last story. And forgive us for not having the energy to make these posts seem like they were actually written on the day they are posted. Well in the last story, we wrote that we had a plan to get to PV, but unfortunately that plan was shot down at our next stop when we encountered further problems with our regulator. We decided to skip out on several of our planned stops in favor of just getting to a mechanic asap. So that meant a looooong journey one day to an anchorage called “Punta Ipala” right before the big cape crossing. The plan was to motor for 10 hours straight in light wave and wind conditions. Ohhh but has the weather report ever actually been correct? The waves and wind were anything but light. Hitting us straight on, we bounced up and down, fighting hard to ride the waves while salt water sprayed continuously over the dodger and into our faces. We think winds were at about 32 knots, and the waves 6-7 feet. It was hard to make our way around the boat in those conditions. And to make matters worse, the force against us was so strong, that we were barely making any headway. Inching along at 1 – 2 knots, we arrived at Punta Ipala 17 hours later at 10 pm, absolutely exhausted. Diana and Anne being the experts they are, they avoided the ominous fish traps and rocks flawlessly while anchoring, and we had a good night’s sleep. Arriving in PV: After another long journey from Punta Ipala, we finally arrived in Puerto Vallarta, dearly excited to see big buildings are resorts ahead. Somebody was looking after us, because we managed to get a spot at a marina/resort called “Paradise” where we’d previously had trouble getting in. And it is paradise. 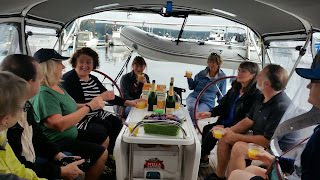 We bought ourselves a chocolate cake and champagne to celebrate Arctic Loon’s arrival at what Anne calls “the beauty spa.” She’ll get all fixed up and ready to cross the ocean here. We’re only about a month out from our journey across the Pacific! 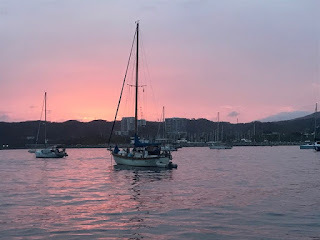 Feb 7: Departed Barra marina (finally!) in the morning. Found engine coolant was still dripping a little but left anyway. 15 minutes in, voltage alarm went off. Regulator wasn’t working. Anchored in close by Melaque. Feb 8: Shopped in Melaque in the morning- bought lots of new bathing suits. Departed Melaque in the afternoon and went to Cuastamate (otherwise known as “Secret Anchorage”) only a few miles away. Feb 9: Departed Cuastemate at 11 am, planning on a short journey, but discovered further engine issues (regulator was completely broken – could no longer trip it). Decided to get to PV as quickly as possible, so took 35 mile journey to Chamela. Feb 10: Full day in Chamela. Had an adventure trying to get the Dingy to shore. Successfully parked down the river and had dinner on the beach. Feb 11: Departed Chamela at first light for a planned 10 hour trip to Punta Ipala. Huge winds and waves turned the trip into a 17 hour trip. Anchored at 10pm, absolutely exhausted. Feb 12: Full day resting at Punta Ipala, getting ready for crossing Cape Corrientes. Feb 13: Woke up at 4am not wanting a repeat of our last day of wave riding. Took 10 hours to motor to Paradise Marina in PV. Sending Positive Vibes for an uneventful Puddle Jump! !